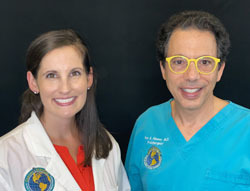 Ross Hauser, MD Phillips H, Maddela H. Platelet Rich Plasma Prolotherapy as first-line treatment for meniscal pathology. Practical Pain Management. 2010;July/August:53-64. Meniscus injuries are a common cause of knee pain, accounting for one sixth of knee surgeries. 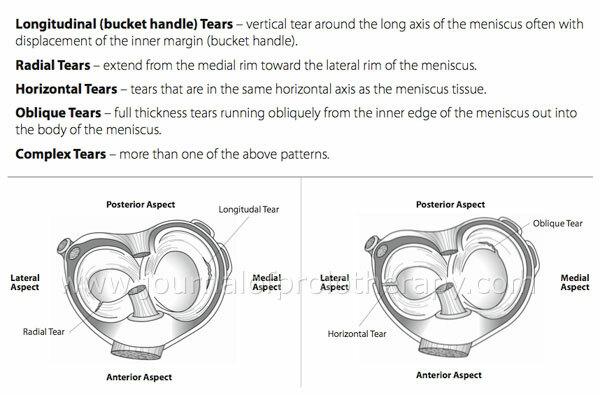 Tears are the most common form of meniscal injuries, and have poor healing ability primarily because less than 25% of the menisci receive a direct blood supply. While surgical treatments have ranged from total to partial meniscectomy, meniscal repair and even meniscus transplantation, all have a high long-term failure rate with the recurrence of symptoms including pain, instability, locking, and re-injury. The most serious of the long-term consequences is an acceleration of joint degeneration. 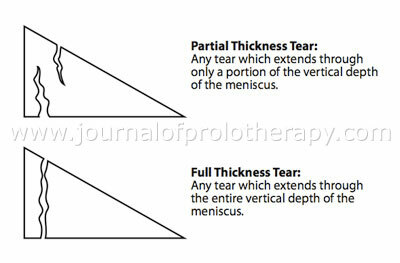 This poor healing potential of meniscus tears and degeneration has led to the investigation of methods to stimulate biological meniscal repair. Research has shown that damaged menisci lack the growth factors to heal. In vitro studies have found that growth factors, including platelet derived growth factor (PDGF), transforming growth factor (TGF), and others, augment menisci cell proliferation and collagen growth manifold. Animal studies with these same growth factors have confirmed that meniscal tears and degeneration can be stimulated to repair with various growth factors or solutions that stimulate growth factor production. The injection technique whereby the proliferation of cells is stimulated via growth factor production is called Prolotherapy. 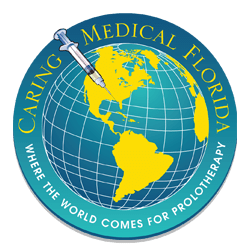 Prolotherapy solutions can include dextrose, human growth hormone, platelet rich plasma, and others, all of which stimulate connective tissue cells to proliferate. A retrospective study was done involving 24 patients, representing 28 knees, whose primary knee complaints were due to meniscal pathology documented by MRI. 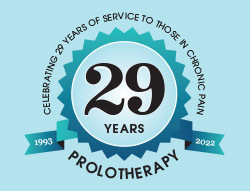 The average number of Prolotherapy visits was six and the patients were followed on average 18 months after their last Prolotherapy visit. Prolotherapy caused a statistically significant decline in the patients’ knee pain and stiffness. Starting and ending knee pain declined from 7.2 to 1.6, while stiffness went from 6.0 to 1.8. Prolotherapy caused large improvements in other clinically relevant areas such as range of motion, crepitation, exercise, and walking ability. Patients stated that the response to Prolotherapy met their expectations in 27 out of the 28 knees (96%). 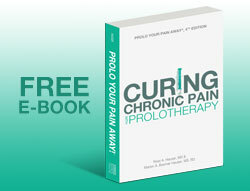 Only one out of the 28 patients ended up getting surgery after Prolotherapy. Based on the results of this study, Prolotherapy appears to be an effective treatment for meniscal pathology. While this is only a pilot study, the results are so overwhelmingly positive that it warrants using Prolotherapy as first-line therapy for meniscal pathology including meniscal tears and degeneration. One of the most vital roles of the meniscus is to provide lubrication to the knee, which it accomplishes through diffusing synovial fluid across the joint. Synovial fluid provides nutrition and acts as a protective measure for articular cartilages in the knee.26 The femoral condyle in the knee is covered in a thin layer of articular cartilage, which serves to reduce rotational friction and to withstand weight bearing. This cartilage is very susceptible to injury both because of its lack of proximity to blood supply and the high level of stress placed on it by excessive motion.27, 28 The meniscus, therefore, is able to provide a much-needed source of nutrition to the femoral and tibial articular cartilage by spreading fluid to that avascular area. 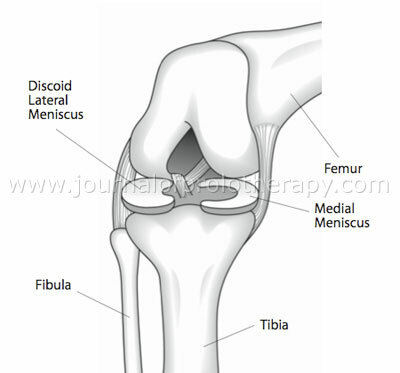 Another condition which can be both a cause and complication of meniscal tears is a discoid meniscus. (See Figure 7.) A discoid meniscus occurs when the lateral meniscus takes on the shape of a disc, rather than a crescent, and is most often manifested in adolescence.44 Although the cause has never been officially determined, the repercussions of a discoid meniscus have been widely documented. Often referred to as “snapping knee syndrome,” this condition is identified with its only symptom, snapping on extension. The “snap” is caused when the femur and the meniscus are not able to move in sync with each other and the femur either slips over a ridge in the meniscus or off of the meniscus altogether.45 Unlike the normal meniscus, which is shaped to fit the condyle of the femur, a discoid meniscus lacks the configuration to serve as a stable surface for motion. This abnormal tracking adds stress on the meniscus, increasing the probability of lateral meniscus tears.46 Unfortunately, discoid menisci often remain undetected when no symptoms present prior to injury, and the only other way to identify a discoid meniscus is by magnetic resonance imaging (MRI). One study that brought these issues into the spotlight was performed on college basketball players at Duke University who displayed no clinical symptoms of knee abnormality. 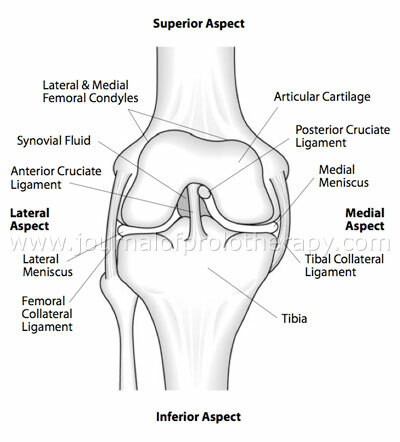 Internal irregularities of the knee including cartilage defects, joint effusions, bone marrow edema, and even discoid menisci were found on the MRIs of 75% of subjects, who never displayed any symptoms of meniscal abnormality.47 When an MRI shows a tear or meniscal degeneration when the person has no symptoms, this is called a false positive. The MRI is falsely positive. Kornick and associates investigated 64 volunteers, between the ages of 10 and 74, and found that over 25% had abnormal signals in their menisci, despite being totally asymptomatic.48 More distressing is the fact that in another study on children, mean age 12.2 years, 66% showed a high signal intensity within the menisci.49 A high signal intensity is one of the criterion to diagnose degenerative menisci. (See Figure 8.) Perhaps the best study to date to document abnormal meniscal MRI findings in asymptomatic individuals was published in the New England Journal of Medicine in 2008.50 In this study, MRI scans on 991 knees were taken and compared to clients responses about pain and disability in those knees. The prevalence of meniscal tear or of meniscal destruction in the knee as detected on MRI ranged from 19% among women 50 to 59 years of age to 56% among men 70 to 90 years of age. The MRIs in these patients ages 50 to 90 showed that over 60% had meniscal tears documented on MRI and that 61% of subjects who had meniscal tears did not have any pain, aching, or stiffness in their knees.